Combining innovative technologies with the natural feel and dynamic response that drummers expect, Roland V-Drums are the standard by which all other electronic drum kits are measured. 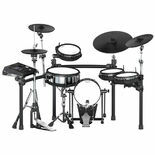 The flagship TD-50 series delivers the ultimate V-Drums experience, bringing Roland's latest sound and hardware advancements to powerful kits that strike a commanding presence on any stage. They're also ideal for home playing and studio use, with built-in practice features, USB connectivity, and much more. 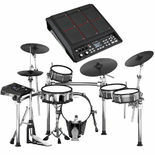 If you're looking for the very best electronic drums on the planet, look no further than the Roland TD-50 series. At the heart of each TD-50 set is the TD-50 sound module with Prismatic Sound Modeling, which provides Roland's most expressive and wide-ranging sounds to date. Combined with snare and ride pads that include advanced multi-element sensor systems, you'll enjoy incredibly detailed playability that blurs the lines between digital and acoustic. And if you're a performing drummer, there's no better choice than the top-of-the-line TD-50KVX set. It features a full-size 22-inch bass drum that offers big acoustic stage presence with an all-maple shell and custom hardware, plus innovative air-damper mechanics for perfect triggering and authentic feel. 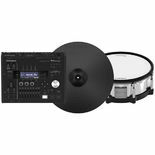 The TD-50 module includes a wide selection of ready-to-play kits, and also supports deep sound customization and user sample loading through its intuitive interface. There's an enormous range of sound processing on tap as well, allowing you to refine your sounds with true studio precision. Via USB, the TD-50 can connect to a computer DAW and send up to 10 channels of audio. And with master XLR outputs and eight TRS balanced outputs for individual drums, you can easily interface with any stage PA setup. If you have any questions or would like to purchase a Roland TD-50 series V-Drums set, please call our experienced sales staff at 1-888-659-3477 or reach out to us online.